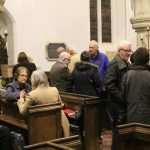 On the evening of the 18th January a splendid number of people came to All Saints church, Cuddesdon, to celebrate the completion of the restoration of the bells. 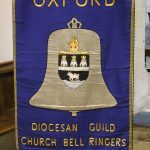 It was lovely to begin the evening hearing the bells being rung by our own team of bellringers who have been training with Brian Lowe for over a year. 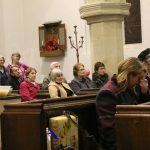 Thank you to our friends at St Giles’ church, Horspath for allowing us to train in order to be able to ring our bells once they were restored. 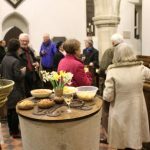 Reverend Dr Emma Pennington opened proceedings with and welcome and we would like to thank her for organising the drinks and nibbles for the event. Keith Hawley went on to thank everyone for their interest in the project and all those who had supported the restoration with their time, donations and fundraising events, as well as the many skilled and knowledgeable people who had helped in completing what has been a project of epic proportions. 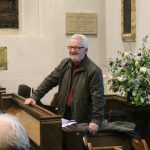 Brian Lowe went on to show us, with the help of excellent slides, how the project had been achieved; starting with the casting of the new treble at Whitechapel foundry, to the strengthening of the frame and the refurbishment of the ringing chamber. 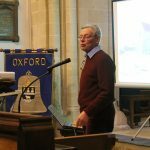 He praised the bell hangers Whites of Appleton for skill in removing and then reinstalling the bells, turned and tuned. 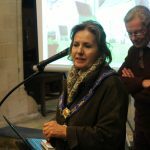 The evening finished with a short speech from Lorraine Hillier, chair of South Oxfordshire District Council, which had given a substantial grant towards the project, in which she said how happy they were to help community projects such as this. Many thanks to everyone who has made the Bells Restoration Project Possible. It’s wonderful that All Saints has its voice once more.